The 25 m Great Buddha Statue in the Japanese Kamakura style was unveiled by his holiness Dalai Lama in 1989. 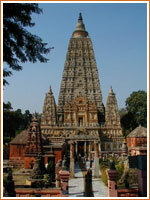 Bodhgaya is 12 km from Gaya, 140 km from Patna, 66 km from Rajgir and 482 km from Calcutta. By Air : Patna is the nearest airport with regular flights to Delhi, Ranchi, Lucknow, Calcutta, Chennai, Mumbai. Calcutta, 482 km, has an international airport. By Rail : Gaya is the nearest railway station. Several superfast as well as express trains are available from Gaya. Gaya is on the main Delhi to Calcutta line and there are direct trains to Delhi, Calcutta, Varanasi, Puri and Patna. By Road : Bihar State Road Transport Corporation (SRTC) has bus services to Gaya, Patna, Nalanda and Rajgir. The main bus stand is opposite the Mahabodhi Temple. Private buses and taxis are also easily available. NALANDA : Nalanda was the most renowned university in ancient India. It derived its name from Na-alam-da, meaning Insatiable in Giving, one of the names by which the Lord Buddha was known. Established in the 5th century B.C. it remained a live center of learning till the 12th century A.D. Bodhgayawhen it was destroyed by the invader Bakhtiar Khilji. Lord Mahavira and the Buddha both taught here for years. Hsuan Tsang. the Chinese traveler studied here in the 7th century A.D. and there is a monument in his memory. He was one amongst many of those from East and Southeast Asia who came here to study logic, meta-physics, medicine, prose composition and rhetoric. The university of NalandaNalanda offered free educational and residential facilities to as many as 10,000 students and 2000 teachers, for it was supported by a number of villages. Its library, Ratna Sagar, is believed to have contained nine million volumes. It is not surprising, then, that the destruction of this university dealt a crippling blow to Buddhist education in India. The Archaeological Survey of India maintains the Nalanda Museum across the road which houses some exquisite bronzes of the 9th and 10th centuries, Pala dynasty, and other remains excavated at the site. The beautiful Thai Temple and the Nava Nalanda Mahavihara, a centre for research in Pali and Buddhist studies, are 2 kms from the main site. By Air : The nearest airport is Patna, 99 km away. By Rail : The nearest railway station is Bhakhtiyarpur, 38 km away connecting Delhi-Howrah mainline.